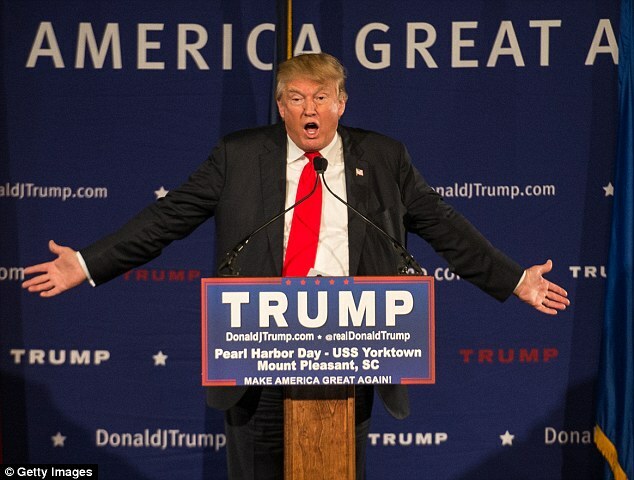 KATIE HOPKINS: Don’t demonise Trump, he speaks for millions of Americans. And who can blame them for not wanting to end up like us? ‘Trump is terrifying. We have seen the future—and it is bleak’ said one reporter. 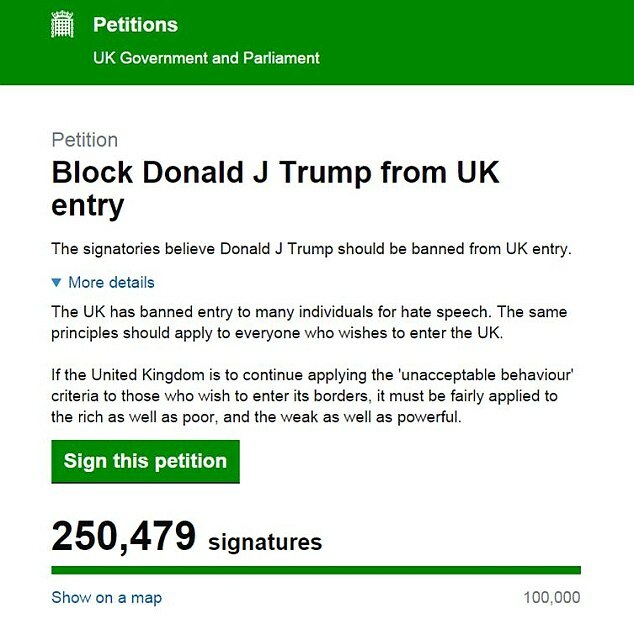 In turn, thousands are busy clicking on a hideously impotent petition to ‘BAN TRUMP FROM GREAT BRITAIN’. What exactly are they achieving? Having their say? 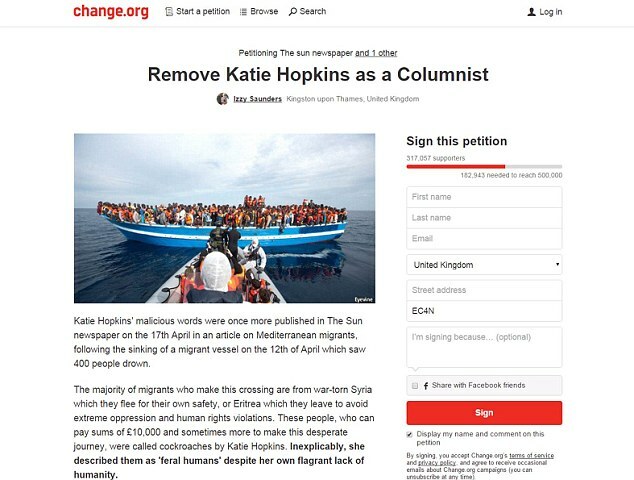 Joining in the outrage bus? No doubt petition sites like change.org are on their web favourites, right up there with erectile dysfunction.co.uk. and single.com. They may as well calm down. We are not banning Donald from the UK. And even if Trump were elected President, he wouldn’t be able to ban Muslims from his shores – even if he wanted to. Ask yourself: how could he possibly make it work? America struggles to control its southern border as it is. It is not going to be able to change the global passport system and get your religion stamped on your passport or your head to establish your faith. What’s the Christianity test going to be? Snurfling a hot dog whilst singing ‘Give me joy in my heart, keep me praising’? After a Muslim couple gunned down 14 residents of San Bernardino, California, Americans looked for strong leadership. Just like after 9/11 when Bush made like a dog of war and took the fight to the terrorists. In contrast, Trump IS providing leadership. He knows some of his grand-standing is hot air. But he is articulating a sentiment held by millions and reinforcing himself as a protector of the American people. It’s the reason Trump is the Republican front runner. He has spent just $330,000 on broadcasting to Jeb Bush’s $42.5 million —which is indicative of how much America is enthralled by this new voice. I hear cries that he is a blithering idiot. I have often been called a deranged fool. But if this were true you could ignore me, ignore us, imaging the two of us shouting naked at the rain. It’s because we articulate sentiments repressed by the politically correct consensus that we have a voice. Within moments the Met Police, Prime Minister David Cameron, and the clownish Mayor of London, Boris Johnson, jumped to defend the reputation of the UK and distance themselves from this glaring truth. Yet, at the time of writing, no less than five bobbies on the beat have come forward to confirm that there ARE estates where they will only patrol out of uniform. There is fear among the police AND the public. I work with a team of cameramen in town who text their wives and partners on the hour to confirm they are safe. My family is not keen for me to be in the capital. Some friends will no longer come to London. How do you feel about the security of the city’s shopping centres right now, after what happened in Paris? I watch the BBC news, our national broadcaster, ramming home messages of inclusiveness. Today they gave platform to a representative of the Muslim community telling Trump he is an Islamophobe and is not welcome here. But that’s not my voice. That is not the voice of a nation. All Brits don’t think that way. Being force-fed multi-culturalism brought us to this place. When the only permitted message is acceptance, any views to the contrary result in a label to shame you into silence. Don’t just stick a label it. Be curious. Wonder, how has Trump come to articulate the views of a majority of Republicans across the States? Because I don’t buy into the clear divide between extremist Muslims and peaceful ones. I don’t see these as two separate entities. It is a sliding scale, a spectrum. From utterly peaceful, to ambivalence to sympathising, to extremist, to a man blowing up buses in Woburn Place. It is the same slippery slope which sees regular mosque attendees from Luton slip off to Syria to join ISIS. And suddenly a tight knit Muslim community knows nothing. Not the local imam, not local families, no one. No one denouncing terrorism. Just a wall of silence. In our country. Hate hidden behind walls we are told to accept and tolerate because we are multi-cultural. Repeat after me. Multi-cultural. History teaches us lessons were refuse to learn. The IRA would not have enjoyed decades of success without many among the Northern Irish Catholic population acting just the same way as the imams and family and friends of extremists in Luton today. We have gone too far and lost control of vast swathes of our country. In part we ARE a radicalised nation and it does nobody any favours to deny the obvious. Trump wants to call a temporary halt to Muslim immigration until America figures out what is going on. Adversaries may be quick to jump on Trump and make him the problem. But look around. You are too busy gazing at the fluff in your navel to see the gangrene in your foot. You lost sight of terrifying. It isn’t a big, brash American untroubled by the need to be loved. It is the march of ISIS and the so-called Islamic State. You may want to distance yourself from Trump. You may want to carry on navel gazing. But for many Americans, Europe is rapidly becoming an example of everything they never want to be.